You need a software system that knows your industry. Lizzy has the efficiency, speed & performance that you’re looking for. You demand efficiency & performance from the units you sell… why not demand it of your BMS? You’re busy selling & servicing the tools that consumers and companies need to keep their properties looking great, and you need a software program that works as hard as you do. We understand. 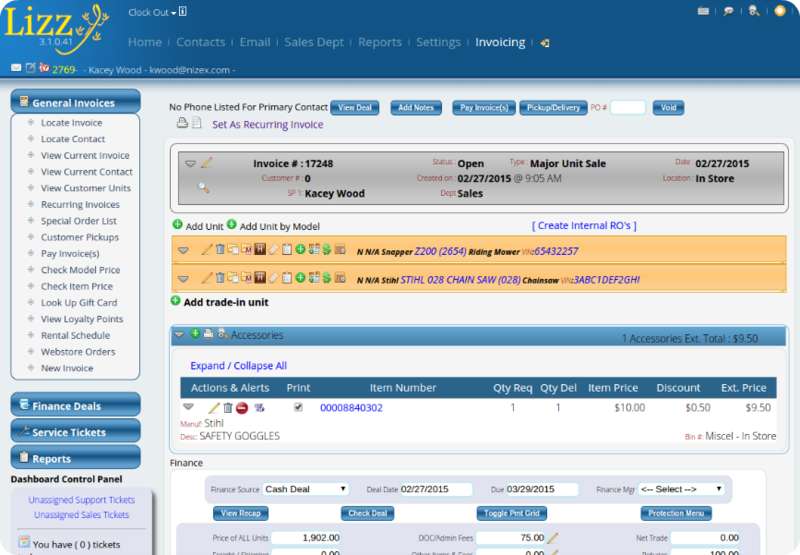 Lizzy was built to manage the concerns of OPE dealerships just like yours. And with over 20 years of experience helping small engine dealers be more profitable and productive, nizeX has the know-how to help your business prosper. From parts to sales to service, and even rental, consignment, and e-commerce/webstore, Lizzy can handle every part of your business. Web-based is the trendy thing to do these days. But Lizzy was ahead of its time. First offered back in 2009, Lizzy was the OPE industry’s FIRST web-based DMS. Now while our competitors are creating their own hosted versions, we’re on to what we do best: adding cutting-edge features for no extra charge. Going web-based lets you leave behind server backups and time-consuming software updates. And our knowledgeable team ensures your data is always secure, yet easily accessible when you need it. Our approach to sales and customer service is based on what suits your needs, not ours. There is a small up-front fee to get started, and a reasonable monthly fee based on the number of people who will be using Lizzy. There’s no worry about us holding your data hostage like some of our competitors, either. We’ll guarantee that your data is yours — forever. The best part? You’ll never pay extra for software features, because everything’s included. Your monthly fee includes tech support, software updates, AND automatic price file updates. Call us today to find out how just how different we really are.